HARTFORD, Conn. - The UConn men's hockey team earned their first-ever Hockey East win Wednesday night, knocking of the No. 3 nationally ranked Boston College Eagles, 1-0, in front of a sellout crowd of 8,089 at the XL Center in their home opener. Sophomore Evan Richardson (Nanaimo, British Columbia) provided all the offense the Huskies would need, scoring the game's only goal midway through the first period. Sophomore Rob Nichols (Dallas, Texas) made it stand up, stopping all 35 shots he faced in recording his second career shutout win. The Huskies improved to 2-4-2 overall and with their first Hockey East win are now 1-2-0 in the league. BC fell to 4-3-0 and 1-2-0 in Hockey East as they suffer their first shutout loss in 106-straight games. The win is marks the fourth time in program history the Huskies have beaten and ranked oppoenent and the third time under head coach Mike Cavanaugh. BC is the highest ranked team the Huskies have ever beaten, coming in at #3 in both polls this week. UConn came out flying to start the game and outshot Boston College, 13-9, over the first 20 minutes of play. The Huskies failed to score on their first power play chance of the night four minutes in but hit pay dirt when Ryan Fitzgerald was called for roughing at 10:41. UConn's Kasperi Ojantakanen (Helsinki, Finland) played the puck from the right wing along the blue line to fellow freshmen Johnny Austin (St. Louis Park, Minn.) at the point. Austin looked for Richardson in the left circle and sent a pass the sophomore played off the boards. The BC defense collapsed giving Richardson time to pick his shot, beating Thatcher Demko top-shelf with a wrister at 11:32 for a 1-0 lead. Richardson, who transferred to UConn this season after spending his rookie year at Boston College, picked up his second goal of the season and his second on the power play. The Huskies came into Wednesday night's game just one-of-19 on the year on the power play (.053). From there Nichols and the Husky defense went to work, keeping the ninth ranked offense in the nation (3.50 gpg) in check the rest of the way. UConn fought off 16 shots on goal in the second period while killing off a pair of power plays including a five-on-three chance for BC. The Eagles out shot the Huskies 10-3 in the third period but couldn't solve Nichols. The Huskies blocked 15 shots on the night, coming into Wednesday's game ranked second in the country (18.86 pg). 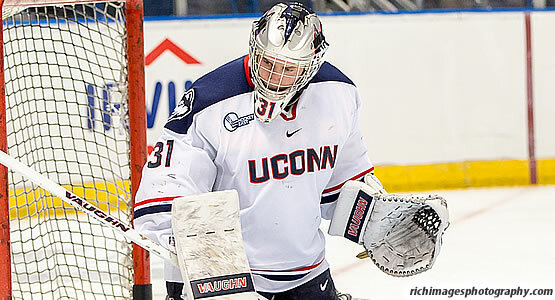 Nichols picked up the win in net and has allowed just two goals or less in seven of the Huskies eight games. BC's Demko made 21 saves for the Eagles. Copyright © 2019 Hockey East Association. All Rights Reserved.